Lancome Advanced Genifique Sensitive Antiocidant Serum/0.68 fl.oz. 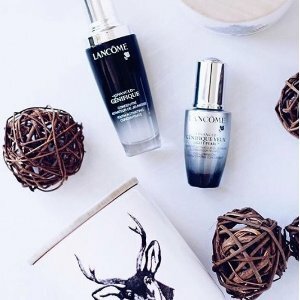 Lancome Advanced Genifique Eye Light Pearl Eye Serum-0.67 oz. Lancome Matte Shaker High Pigment Liquid Lipstick — 0.028 oz. Lancome Energie de Vie The Illuminating & Purifying Exfoliating Mask/2.6 oz. Lancome Absolue Precious Cells Nourishing and Revitalizing Rose Face Mask/2.6 oz. Lancome Renergie Lift Multi-Action Ultra/1.69 oz. Lancome Teint Idole Ultra Liquid 24H Longwear SPF 15 Foundation/1 oz. Lancome Red'y In 5/0.2 oz.